A WFOE in China is a 100% wholly foreign-owned enterprise doing business in China. The foreign company has sole responsibility for its profits and Losses. It is required to register as a legal person who is restricted to certain businesses. The enterprise is able to implement strategies that effectively conform to the interests of the parent company aboard. Moreover, technology and know-how are given better protection. Whether you need a partner in china for company formation? You can register a WFOE to have the total control of the company. A good business service provider will help you handle a lot of necessary initial jobs in the setup phase. Is there any minimum amount requirement? It had been a long time, in real practice, for a consulting/technology company, min. RMB1M (or USD140 thousand) is required, this policy was cancelled just a few months ago in many cities, I confirmed this in Hangzhou and Shanghai. earlier 20% shall be in the account during the registration after get the license, the remaining part shall be in place within the coming 2 years, now this will be more comfortable to fulfill. 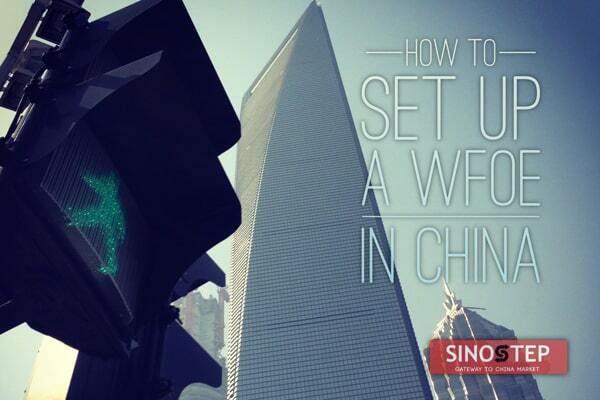 What is the average time frame for setting up a WFOE in China? Normally 3-4 months are needed for the whole step, and you can get the business license within around 2 months. Which city should I start? : Beijing or Shanghai? or somewhere else? It all depends on your China market plan, there will be some differences in labor cost, market situation. You should do your research and find our where your competitors are and where is your market. Many companies will start from 1st tier cities like Beijing, Shanghai, Guangzhou and Shenzhen. Hereunder are an typical example to register a foreign consulting/technology service company in Shanghai. It is for your reference only, please consult us since there might be different policies in different cities. Two Photocopies of Business License of the investing company. (If investor is a Hong Kong Company, it should be notarized by China law service (Hong Kong) company limited). Some of steps can be handled at the same time. but we need to count the material preparation time, weekends and holidays. We will prepare most documents in our end, you will need to prepare some notarized paper in your country, we need to consider the time spent on this. Registration Name Check is the first step and sometimes choice of name will take some time due to repeated names. Get a name for your business. There is no specific import & export license since 2008, however now it is called the rights to do import and export. You needs to register at several departments, Industrial and Commercial Bureau, Customs, The entry and exit inspection bureau, China electronic port and foreign exchange management bureau. normally it takes 60 days to get all the documents. since Minimum amount requirement is cancelled, it is quicker and easier to set the company up. There will be annual review by several departments, this could be done by your staff later. It is not a difficult job, especially in big cities in China. You need to consider the traffic, cost, decoration and the service. You can outsource or hire an accountant under the company. You can do this by yourself, or you can ask us to be together with you for assistance. We will recommend banks for you and make the appointment free of charge. You may relocate your staff to China or hire your local staff in China. Tell us about your specific needs, we will get back to you with a customized analysis and facilitate your WFOE setup in China.